Prior to the days of mass communication, consumers had to rely on bias, and somewhat fabricated, ‘information’ fed to them by advertisers and brands. Gone are the days when you could happily fill your kids body with coke or beer, unbeknownst to the consequences. Some of the psychological tricks and persuasions that marketers use today have been around for over a hundred years. But thanks to a number of laws and regulations that have been passed over the years, advertisers have less leeway to state that a product can turn you into Mr. Universe, or that fizzy drinks are a better substitute than milk for new born babies. Here is a list of some print ads from pre-20th century; some of which are genuinely creative, while others are morally questionable. Many of the common illegal drugs in circulation today were at once considered to be viable medical solutions for headaches, fatigue, toothaches, pain, and more. This sweet little ad shows two kids playing happily together. Assumedly, the little blighters are now in good spirits after curing their agony with a few pops of Charlie Brown. 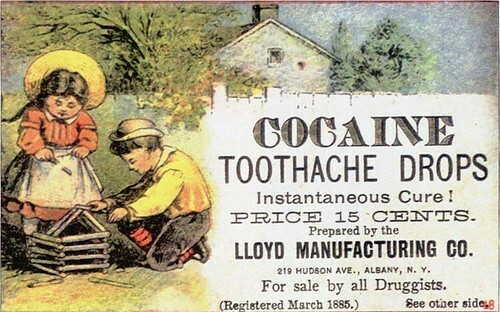 This advertisement was in circulation in 1885, almost 90 years before cocaine became considered a controlled substance by the US government in 1970. At first glance, this may look like an innocent ad that displays a mother’s love for her child. Look a little closer and you’ll notice that it’s an ad for Anheuser-Busch; the US brewers better known for Budweiser. Back in the days when you could be tanked up while riding a horse and cart, it was also OK for a mother and her child to share a tipple of the good stuff. Anheuser-Busch once advertised their Malt-Nutrine product, which included such benefits as aiding appetite, digestion, and sleep. The product contained about 2% alcohol and was promoted as a medicine great for mothers and babies alike. 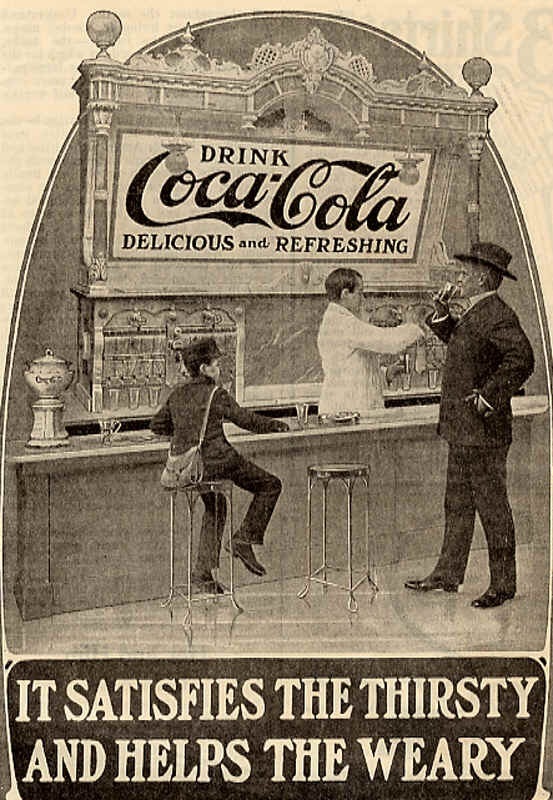 Coke was one of the first companies to invest heavily in advertising before the 20th century. They created a memorable brand in 1886 with the cursive “Coca-Cola” logo that stood out everywhere. The message was always geared towards coke doing more than just simply quenching ones thirst; by providing extra benefits like “helping the weary”, which is probably attributable to the nine milligrams of cocaine added to every bottle in those days. Such “benefits” may be part of the reason for Coca-Cola’s success. This surreal (for the time) advertisement appears to show a frog using cologne, presumably before a date with Miss Toad. It’s either a play off the “kiss the frog and he turns into a prince” story, or a funny way of saying it could even make a frog appealing. Hoyt’s German Cologne claimed to be “fragrant and lasting” and was sold for roughly $1.00 at the time of this advertisement. Like reminiscing about when gas prices were under $2 a gallon, it’s interesting to see cologne sold for $1.00 when it would be hard to find some for under $20 today. While not technically an ad, this one has to be included simply because of the sheer dapperness and chivalry that this dog (or werewolf) represents. This product label for The Young Swell Tobacco Company was created in 1869. In recent decades (and probably for as long we have the media) advertisers rely on celebrities or voluptuous babes to be the face of a brand. Back then, however, the use of animals doing human things was highly popular amongst advertisers. This ad truly took advantage of the lack of consumer knowledge that existed in 1897. The fine print talks about the health benefits of root beer, and how it’s a necessity for the summer months in every home. While even today we might kid ourselves with this, it’s simply not that true. The ad uses enticing language like “when heat and humidity make the earth almost uninhabitable, a cold, sparkling, effervescent glass of Hires Rootbeer will satisfy your thirst” to persuade potential customers. The hook is to get your attention with a common problem, like heat and humidity during the summer, and the close is to offer a solution to that problem; a cold, sparkling, effervescent Rootbeer. Drooling yet? The ad also works on another ingenious level by addressing the issues of global warming, long before anyone knew what the ozone layer was. We don’t realize how lucky we have it today: if you suffer from obesity, then liposuction is at hand. Before then, an alternative solution to curing such an infliction was with tape worms. Or that’s what this ad says at least. 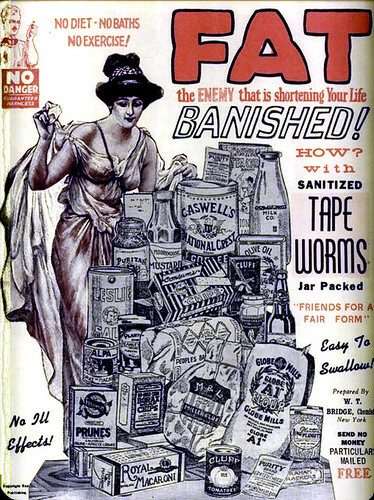 Apparently tape worms proved to be a viable weight loss option, presumably before the private sector tightened up its regulations. It is interesting to see that modern weight loss and questionable procedures got their start long before television commercials and the internet. The ad shows a plethora of tempting foods that are counter-productive to weight loss to emphasize the “no diet – no exercise” benefits of the product. The circle of life is a wonderful thing, especially when there’s a huge mincer waiting at the end of it. 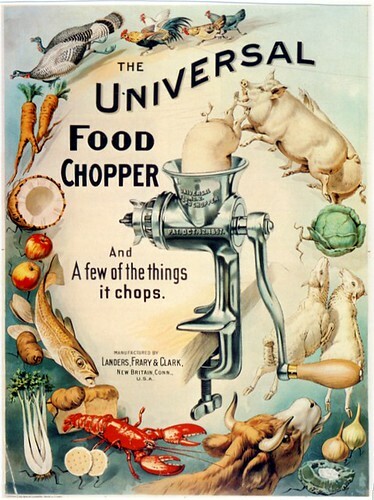 This ad that seems to portray animals willingly diving headfirst into a food chopper would’ve given PETA a field day if only they’d been around at the time. While it seems weird to look at today, animal suicide and self-mutilation was a recurring theme back in the day, as other vintage ads have proven. The French have always been a liberal bunch. Aside from the models unashamedly seductive pose, this ad doesn’t even hold back from displaying a little transparency in the corset, even though the models right leg appears smaller inside the corset. In comparison to more conservative countries like the UK or USA, models would be more concealed in ads during this time. Thankfully, these days we’re a lot savvier to the truthfulness behind the information we’re fed on a daily basis, and have better means of weighing up the facts. While there’s always been an emphasis on creativity, print advertising has evolved over the years in order to keep up to date with public interest. As time goes on, people get smarter and therefore, marketers have to rethink their old hat tricks. The legal regulations that have also passed since before the 19th century have helped protect consumers from deceitful advertising. Outside of technology and regulations, though, what is effective in advertising has persisted through generations – appeal to a person’s emotions; even if that means introducing your kid to socially acceptable forms of drugs. This article was researched and compiled by PrintExpress.co.uk; specialists in business cards, magazine, brochures and booklet printing throughout the UK. This is great…I love stuff..
Each and every printing images are perfectly matched for that colors. it is amazing one. Thanks for sharing this good think. Yeah.. good information,, i liked it..